Take advantage of our Poster Printing Service today and get your message out there. 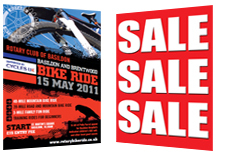 We print posters onto 170gm Matt Poster Paper in photo quality. Our Printed Posters are a great way to advertise. Once you have placed your order you will be sent an email confirming how to get your artwork or photo to us or see our artwork guide page.